Leon Neyfakh wrote an interesting article in the Boston Globe in 2012 entitled, Our Underground Future. Buried nuclear plants? Subterranean stadiums? The next great frontier may just lie beneath our feet. In the article he states, “The long-term vision is one in which the surface of the earth is reserved for the things we want to see and be around—houses, schools, yards, parks—while all the other facilities that are needed to make a city run, from water treatment plants to data banks to freight systems, hum away underground.” The foundation of Mr. Neyfakh’s article is that overcrowding in the big cities and the ever-rising costs of real estate on the surface are causing urban planners from across the globe to consider better ways to use it and the space under the surface. Anyone who lives in a big city can attest to one of the main reasons Neyfakh cites for all the talk of going underground: population boom. In 2015, the world population was 7.3 billion, but United Nations estimates project the population will be 8.5 billion by 2030, 9.7 billion in 2050 and 11.2 billion in 2100 . It’s simple math then: the more people who live in the world; the more houses or apartments (and food and water) must be available. To understand how crowded New York City really is, lets stretch our thinking a bit further. There are 27,878,400 square feet in a square mile. If we divided just one square mile up equally among the 27,000 people living within it, each person would get just over 1000 square feet all to themselves. The rental house we are staying in temporarily is 900 square feet; trust me, 1000 square feet is not very much space for you and your family. Now, I realize, that with skyscrapers and such, New York’s square miles would be better represented by cubic miles, but my point is still clear. It’s no wonder then that New York City is one of the places where people are talking about going underground. Since we are talking about New York City and going underground, did you know that the New York City subway system has 842 miles of track, 443 of which are underground. The subway system also has 14 underwater tunnels covering 145 miles. 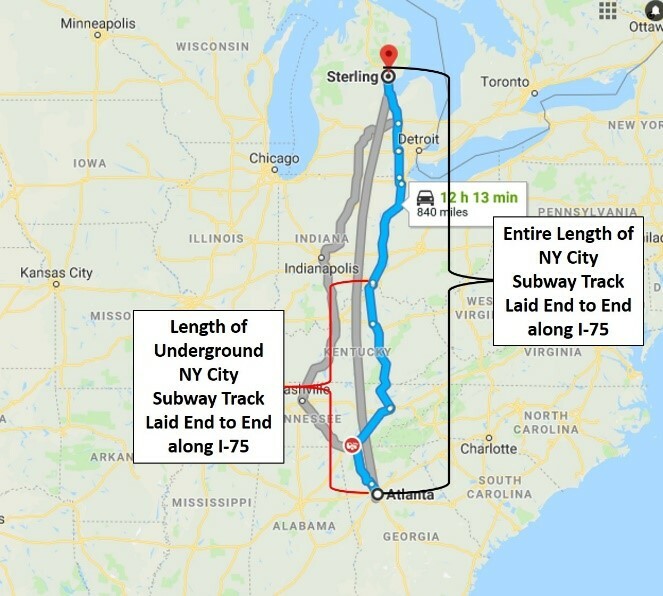 To put this in perspective, if laid end to end alongside I-75, the New York City subway tracks would stretch from Atlanta, Georgia to Sterling, Michigan, and then some. If just the underground portions of the tracks were laid end to end, they would stretch from Atlanta to Florence, Kentucky. If the future is underground, then in New York City, the future is now. The New York City subway system opened 113 years ago, and that is a greater part of the potential problem. Everything wears out over time, including subway tunnels. Imagine the magnitude of disaster, and the ensuing necessary response, if a subway tunnel collapsed. The New York subway system is not the only major transit system that is underground in New York. There are also a several tunnels for automobile travel. The Brooklyn Battery Tunnel for instance, is part of I-478 and is 1.7 miles long. Every day an average of more than 54,000 vehicles pass through both sides of the tunnel. Since New York City is but one of about 20,000 United States cities or towns, we have to take a deeper look at the long-term vision Neyfakh wrote about in his article, so we can understand what our underground future might look like. But first, I think it is safe to say that, by and large, any underground future that is more underground than it already is will be seen in the big cities and not the smaller towns. Meanwhile, a lot of the move to underground that has already occurred is overseas. For example, citizens of Almere, Netherlands, use an underground tunnel of suction tubes, similar to the ones banks use in their drive throughs, that move their trash rapidly out of the city. No garbage trucks necessary for them. In Malaysia, floodwater is discharged through underground highway tunnels. In Germany, a former iron mine was converted into a nuclear waste repository, and scientists from across the globe are looking at ways to build underground nuclear power plants. Hong Kong is probably the city that is closest to what Neyfakh describes as the long term goal. City officials there are trying to put government facilities like sewage treatment plants, water reservoirs, fuel storage depots and the like, underground. In the end, this author has nothing against futuristic plans like those discussed here. 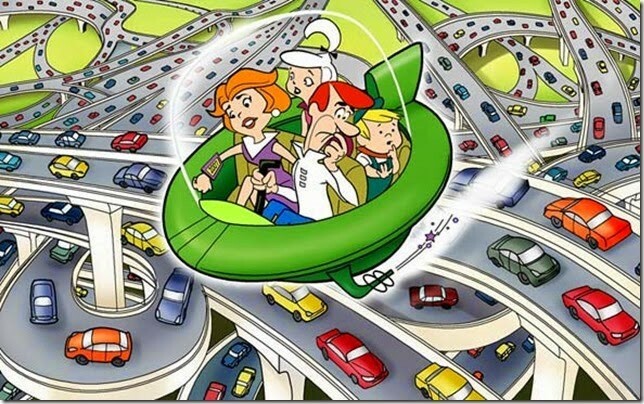 If the Jetsons want to go underground to beat the traffic, I say go for it. However, since underground rescue is among the most dangerous type of rescue today, one can imagine future underground rescue being even more dangerous. Here’s hoping we are ready.